Well, Spring is finally here! All those lovely seasonal vegetables that are just beginning to arrive in the markets, the kind that Italians call primizie—asparagus, baby artichokes, fresh peas in their pods—are beginning to make their appearance in the local markets. There are so many ways to enjoy these vegetables, but one of the loveliest is to mix them all up in a risotto called, appropriately enough, risotto primavera, or Spring Risotto. The choice of vegetables is up to you, so long as they’re in season. Use what you find most appealing in the market, but I’d say that asparagus (just the tips) and peas are pretty much a must. To this, other spring vegetables—even better if they’re of the ‘baby’ variety—can be added as you like (see Notes) as well as the usual aromatic vegetables. You trim them and cut them into bite-sized pieces, sauté them in butter, and proceed as you would for any risotto, following the master recipe. Typically, though, a bit of chopped parsley and/or basil is mixed in at the end, during the mantecatura, for added color and flavor. If you use vegetable broth, the dish can be entirely vegetarian or, if you substitute oil for the butter and omit the cheese at the end, vegan. Sauté the onion and celery in the fat until the onion is translucent over gentle heat. 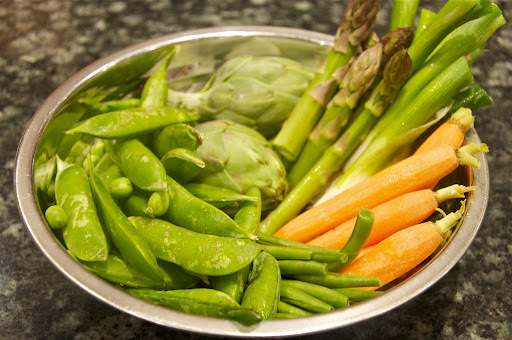 Then add your spring vegetables, mixing them well to cover them in the fat and aromatic vegetables. Let them simmer for a minute or two to absorb the flavors.Toast the rice: Add your rice to the vegetables and raise the flame a bit. Allow the rice to ‘toast’ over moderate heat—stirring all the while to prevent sticking or scorching—then, when the rice has turned a chalky white, add the wine. Let the wine evaporate completely as you continue to stir. Simmer in broth: Now, proceed as you would for any risotto, following the master recipe, adding ladlefuls of broth one by one, letting each ladleful evaporate before adding the next and stirring from time to time. Finishing the risotto (‘mantecatura’):When the rice is al dente, take it off heat and add the parsley, basil and cheese. Stir very vigorously. (Experts will also toss the rice around, but don’t try it at home unless you’re feeling adventurous.) If you like a firmer risotto, you can cover the risotto and let it rest for a minute or two. Otherwise, serve your Spring Risotto right away. Risotto does not like to wait. As mentioned, the number and choice of vegetables for your Spring risotto are yours, but typical seasonal vegetables for risotto primavera include asparagus (use just the tender tips), peas (even better if you can find them fresh in their pods, but if not frozen will do fine). baby carrots, spring onions, Boston lettuce or another green, tender lettuce, baby spinach, baby zucchini, baby potatoes and small French green beans. Many recipes also call for tomato, but for me, at least, tomatoes are more summery than springlike. And there is a very popular (non-Italian) version of this recipe online that calls for leeks and fennel and adding mascarpone at the end—which might be very good, but not very loyal to the original spirit of the dish, in my humble opinion. In fact, you will find recipes that really abandon the whole Springtime concept and call for all kinds of vegetables, even one that includes eggplant and mushrooms along the more usual ones—but to my mind that would more properly be called a risotto all’ortolana or simply a mixed vegetable risotto. By the way, the measurements here are really just suggestions. Recipes vary wildly in the ratio of rice to vegetables, and it’s really up to you. If you like your vegetables with some ‘bite’ to them, one common variation is to sauté the vegetables (other than the onion) separately in butter, then add them to the rice only a few minutes before it’s done. Besides having a firmer texture, the vegetables will retain their bright colors as well. You will sacrifice some flavor, however, as the vegetables will not have had as much time to meld with the rice. NB: If using artichokes and you are not familiar with the technique, see this post for how to trim them in the Italian manner. More or less any kind of broth will do for a Spring risotto (other than fish) but I’d go for a lighter broth made from veal, chicken or—to keep the theme going—spring vegetables. Sauté the onion and celery in the fat until the onion is translucent over gentle heat. Then add your spring vegetables, mixing them well to cover them in the fat and aromatic vegetables. Let them simmer for a minute or two to absorb the flavors.Toast the rice: Add your rice to the vegetables and raise the flame a bit. Allow the rice to 'toast' over moderate heat—stirring all the while to prevent sticking or scorching—then, when the rice has turned a chalky white, add the wine. Let the wine evaporate completely as you continue to stir. Finishing the risotto ('mantecatura'):When the rice is al dente, take it off heat and add the parsley, basil and cheese. Stir very vigorously. (Experts will also toss the rice around, but don't try it at home unless you're feeling adventurous.) If you like a firmer risotto, you can cover the risotto and let it rest for a minute or two. Otherwise, serve your Spring Risotto right away. Risotto does not like to wait. Thanks for stopping by, Inka! This looks delicious and easy to prepare, I definitely gonna try this recipe. Alas, you're not the first one to tell me they've had trouble leaving comments. It was a problem with the old format, too, for some. Anyway, thanks for making the effort, much appreciated! Couldn't agree more, Claudia. Happy Spring! Thanks, Paola! Alas, the template I'm using doesn't allow me to customize the widgets bar. Hope it's not too bothersome—most of my readers use Chrome, it seems. So glad I can see the comments section again, had been meaning to leave some lately and couldn't access it. Lovely risotto! No, no no – I'm with you. it's not a risotta primavera with eggplants and other fall veggies. I'm a purist and if it matures in spring, like these veggies, then it belongs in a primavera. It is spring, isn't it? I mean when the ice is out in the lakes in MN on the day of spring – a miracle has occurred. And one must celebrate weather miracles with a sumptuous dish such as this. I've never used lettuce leaves (or spinach) in risotto but I am inspired to go searching for tender, baby vegetables. This risotto is spring! love risotto and this is a very interesting one!